Whether you’re preparing for your special day or decorating your home, your monogram was made to be used on forever pieces. We believe quality products take time, attention to detail, and a human touch. We encourage you to read our Empress Home guide to learn more about our process. We have curated a collection of beautiful items that can be used on your wedding day, in your new home, and beyond. We invite you to peruse them, and find the ones that speak to you. You found your favorites! Let's make them yours. As you add pieces to your cart, a form will pop up so we can get all the details from you. For embroidered pieces, you'll select your thread color from our palette provided on the listing. Once you submit your order, we receive it and begin work immediately. If we have any questions about your order, we'll reach out! If not, we'll produce, package, and ship your finished pieces, and notify you with shipping information. 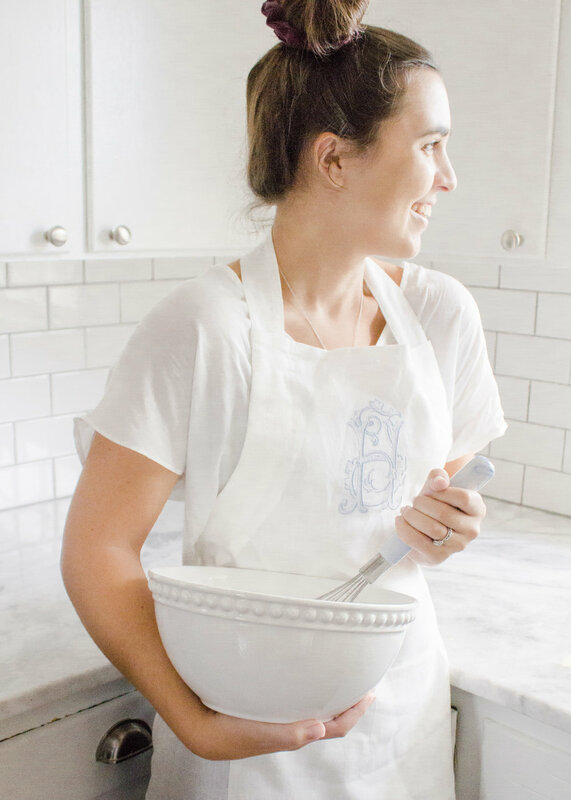 If you do not already have a monogram on file and you're ordering a monogram with your Empress Home order, please note there will be a 3 to 4 week design period added to your overall production time. 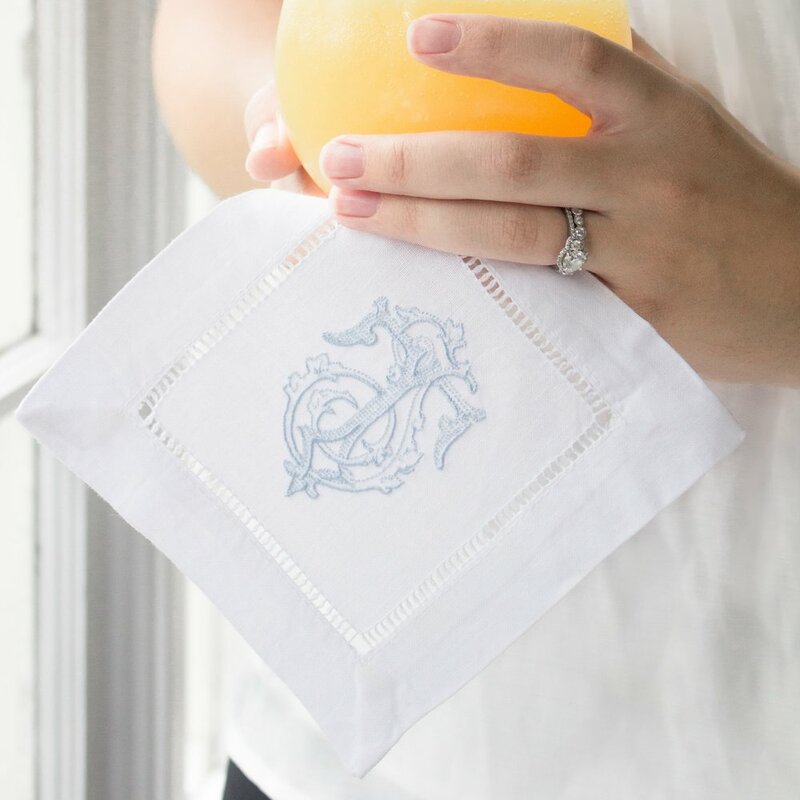 Embroidery utilizes thread to create your monogram design on fabric. Using a process called digitization, we are able to convert your digital monogram file into an embroidery file that can be used again and again. We use special processes to ensure that the details shown in your digital file are achieved with your embroidered pieces as well. Engraving is done by a laser etching your design into the surface of a product. This process is used for all of our wooden products. You can feel the indentation when you run your fingers over the engraved portion. Below are our twelve thread selections. As you fill out your form for each piece, you will be asked to select your thread color. Please note, colors may not stitch out as they are seen on screen. While we do our best to accurately represent the final product, we cannot guarantee a 100% color match to what is shown on your screen. For each of the products in our collection, the sizing and placement of the engraved or embroidered monogram is standardized to best fit the overall look and function of the product. With that, we are unable to move or resize any monogram. For clarity, sizing and placement information can be found on each listing. For linen items, we recommend washing with warm or cold water by hand or using the delicate cycle on your washing machine and with mild detergent to protect the fibers of the fabric. Lay flat to dry. Serving boards should also be washed by hand with warm, soapy water. If needed use white vinegar or lemon to disinfect and remove oily stains. 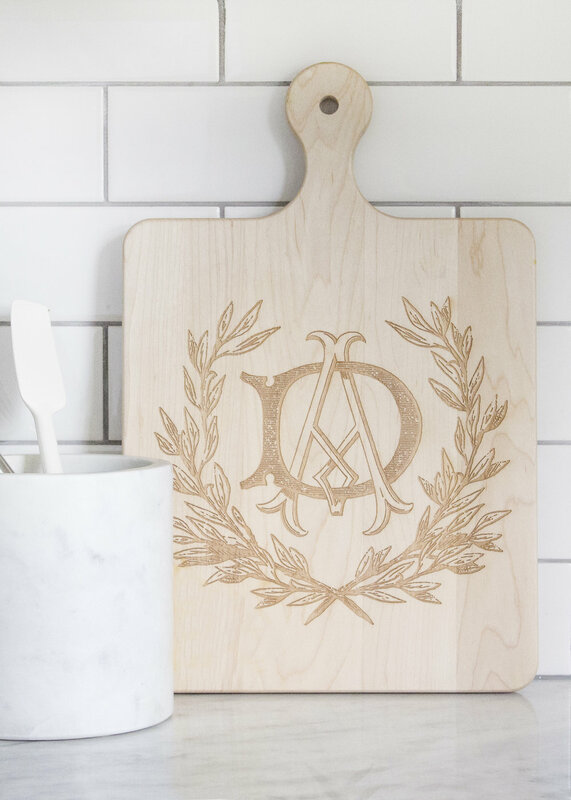 Our engraved boards are designed to be displayed on the engraved side, but are fully functional for cutting, chopping, and slicing on the reverse. Click below for a quick info form.